I have been very excited about the addition of birds in my garden, and now I am excited about attracting butterflies and bees into my garden. Bringing nature, attracting butterflies and other beneficials into your garden is great for the Feng Shui of your home because it brings energy into your garden and adds beauty and calm serenity to your home. It is also great for our planet so why not think about adding plants that help? I went plant shopping for a client this week, and was lucky to find a lovely bunch of asclepias (milkweed) for both them and for me. I plan to have butterflies (and more bees) added to my garden. I have birds, so now it is time to add more to my nature family. 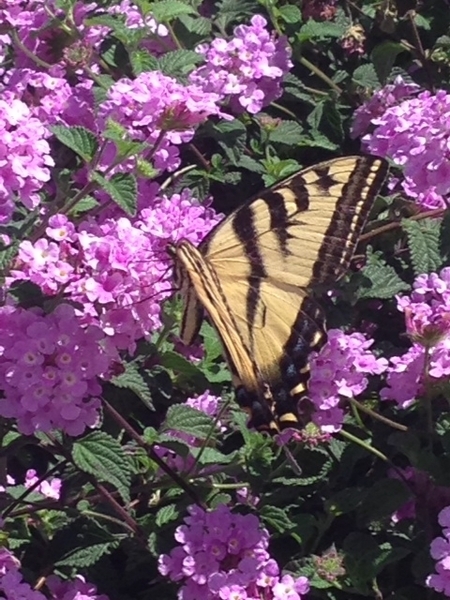 I learned a lot from This Is A Monarchy, in Simi Valley and found out that my front yard fennel is the reason why I keep seeing Tiger Swallowtails! Among the milkweed that I got, one is a Milkweed Vine, which Lynn told me was invasive so I’m buying a trellis this weekend and putting it in one of my larger pots in the front yard. 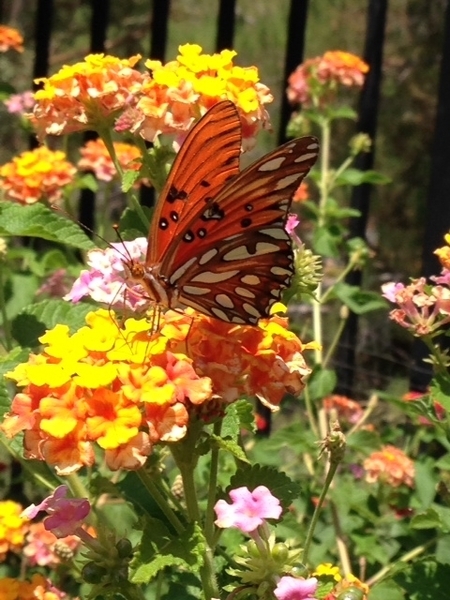 I have decided that all my milkweed is going in the front yard for a couple of reasons. It is toxic, so I don’t want my dogs chewing on it and I figure if most of the birds are in the backyard why not make the front yard a butterfly and bee haven? I am also gearing my garden up with more edibles – so I need those pollinators, a great excuse to plant some monarda, ageratum (my mom’s favorite annual), cosmos, and agastache (I found a beautiful coral variety and planted that in a pot with Juliette tomatoes on the front walkway). 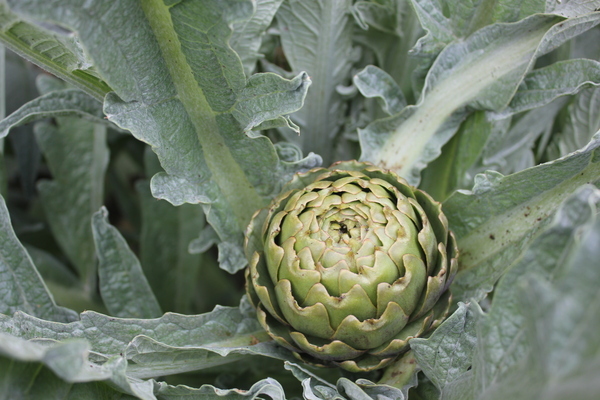 I’ve been sharing my artichoke photos lately, and love that I can plant this baby right in my front yard! Back to the birds: I haven’t gotten any good finch photos they are just too fast and my Yorkie, Thor, runs out every time he sees me heading in the direction of the bird feeder! I need a new longer lens for my camera, maybe that will do the trick. I hope to have some new photos to post soon. 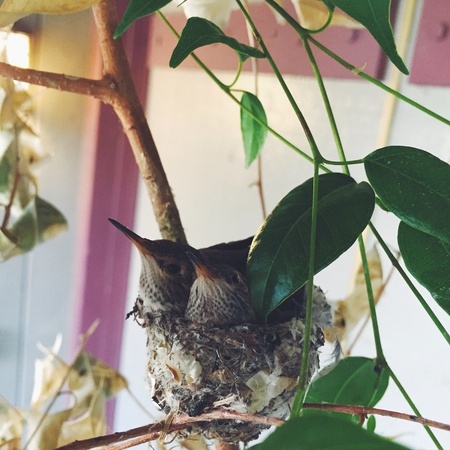 Here’s a new hummingbird baby photo (by my son, Marlon) this is the second set of hatchlings this year in the front of the house. I think the backyard is a little behind them, that nest is more hidden so I haven’t gotten any photos yet. 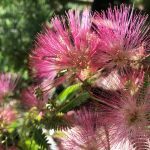 My challenge to you: Plant for pollinators! Nix the pesticides, plant things that the bees and butterflies will thrive on and we’ll all live in a better world. If you would like to learn more about planting for pollinators give me a call or visit my website and contact me there.